Testing out the sandwiches and the not-speakeasy speakeasy at a new Capitol Hill spot. Capitol Hill’s new By the Pound is a deli that’s also getting in on the very long tail end (if it’s even still there) of the “speakeasy” trend: bars that are just like any other bar, but are “secret.” (They are not actually secret.) The fake-speakeasy thing goes back more than 20 years in New York; here in Seattle, Knee High Stocking Co. and Tavern Law’s Needle & Thread (so secret, they have websites) have both been representing since 2009. P.R. materials for By the Pound promised “a passageway within the deli lead[ing] password-holding guests to its hidden craft bar,” but that “We don’t think of the hidden bar at BTP as a speakeasy.” Mmm-kay. Also promised: the culinary leadership of chef Larkin Young, formerly of Canlis, the Willows Inn and more, who’s since parted ways with the management, F2T Hospitality company (on both this venture and West Seattle’s Alchemy). A separate, more elaborate bar menu seems to have been abandoned as well, and from what we tried, the deli itself could use some help. 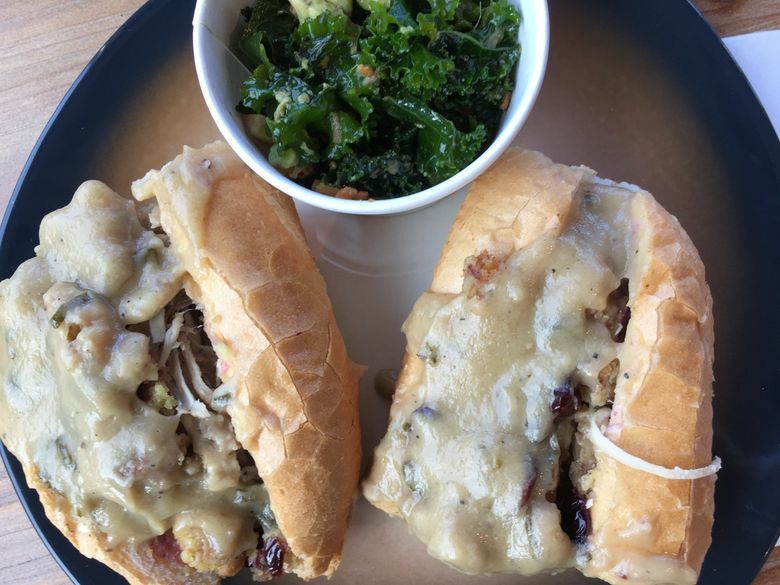 The sandwiches: The best By the Pound sandwich we sampled was the Thanksgiving — served warm, it balanced salty gravy and rich cream cheese with tart cranberries, also featuring stuffing (who doesn’t like stuffing?) and actual pieces of turkey. The excessively chewy roll may have been a little stale, but still, who doesn’t like Thanksgiving? 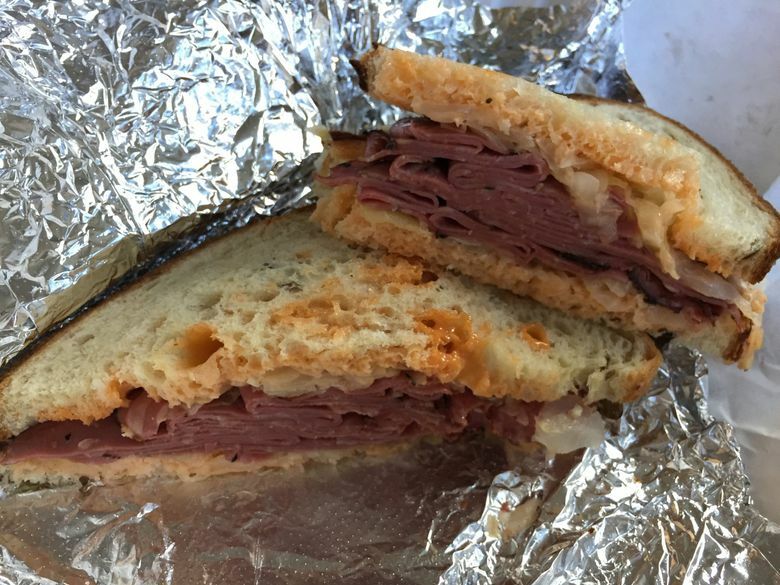 It seems that someone thought better of the original concept of the “Reuben Remixed” as a wrap; it’s now a regular Reuben, but its bread also seemed less than fresh, the meat rather chewy and the Thousand Island dressing so sharply tangy-acidic that the whole sandwich tasted sour. The Harvard Drop-out’s roast beef was very tender and plenty salty; lots of slippery-sweet caramelized onions, a little white cheddar and not-very-horseradishy mayo made the contents slide around a lot. 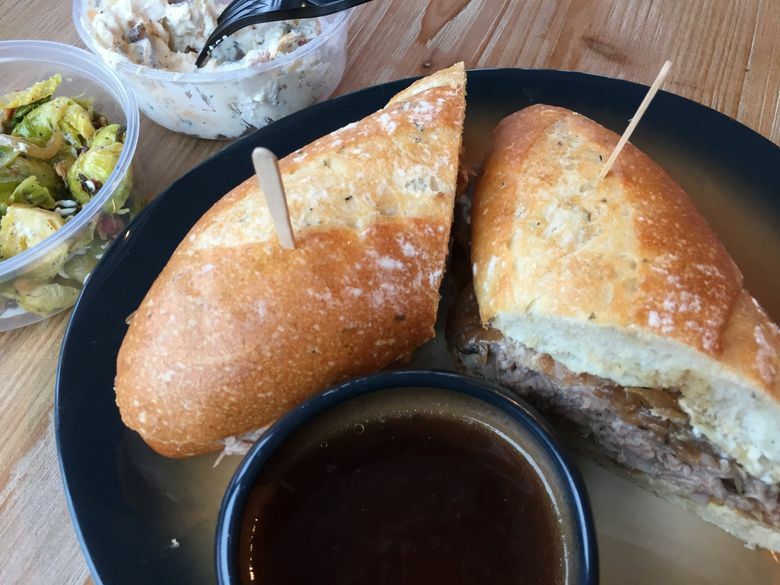 Good thing it didn’t need its extremely saline au jus. 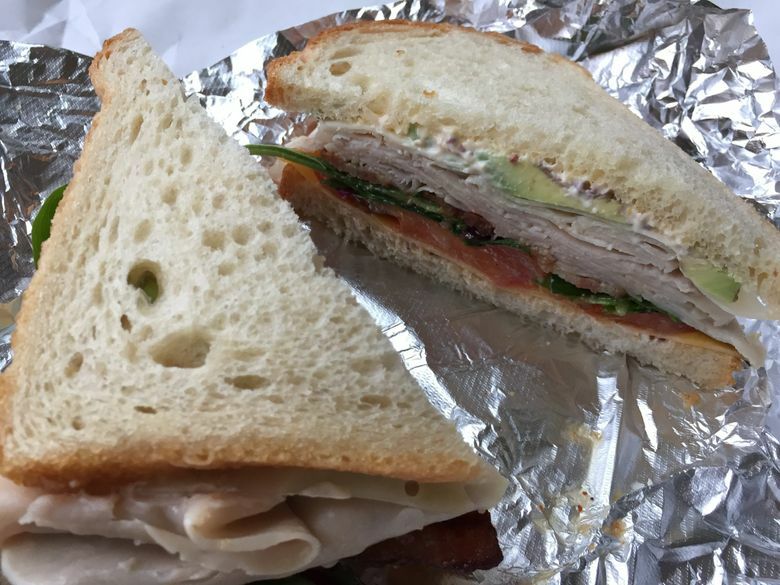 These sandwiches rang in at $13.50, $12.50, $11 and $12.50. They did not seem worth it. The salads: The Brussels Wilson (haha … $8/pound), while lacking the deftness and good instincts of its namesake, tasted fine, though the roasted Brussels sprouts didn’t have any nice sear. The Uncle Ike’s “Baked and Loaded” (haha … $10/pound) was a version of potato salad so laden with sour cream and cheese, the potato almost got lost; with no crunch or spice, the creaminess overwhelmed (maybe THC would help?). The kale, edamame and avocado of the Green River Kaler (ha … ha? $10/pound) tasted fresh, but the ginger-sesame vinaigrette appeared to be missing (no pun intended — it’s too awful). 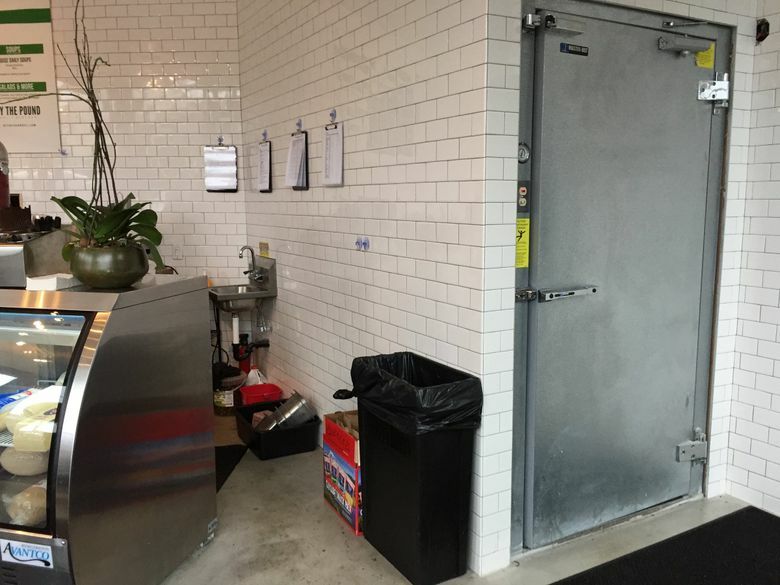 The bar: “The hidden bar in the back” is spoken of freely by the counter staff, and no password is required for admittance through the fake-freezer door. Inside, it’s small but high-ceilinged, intimately dark and lined with shelves of clearly thrift-store books (“Women Who Run with the Wolves,” “A Textbook of Law and Business”). A sizable statue of Lady Justice presides over the bar. Nearby, a faux panel with faux votive lights slides aside to reveal … a speakeasy within the speakeasy! It’s very much like a normal private room, with a longish table and some red upholstered chairs. Upstairs from there, the barman explained unbidden, will soon be yet another room, exclusively reservation-only — the secret “secret” SECRET space! If you need to use the restroom, they give you a potion that shrinks you down and put you in a drawer that leads to it. Just kidding! It’s in the hallway.